This is a smart little PC which is a solid performer and it's temptingly good in many respects, but the V3 isn't for users lacking technical nous. To say that ultra-small computers are in vogue would be a massive understatement. Pint-sized (or even cup-sized) PCs are probably one of the very few bright spots in an otherwise desolate hardware landscape. This has a great deal to do with their versatility and their cost. However, the wide-ranging choice available in the market shouldn't hide the fact that there are good and bad apples. ARM-based devices running Android have been a hit but Intel-powered alternatives running Windows have also proved to be reasonably successful. The better ones have plenty of ports and connectivity options, a powerful processor, a full licensed version of Windows, 4GB of RAM or more, a solid build and some decent aftersales, all for an affordable, not too-good-to-be-true price. The Voyo V3 Mini PC hits some of these sweet spots and does so at a rather enticing price: $201 at Geekbuying with a 4% discount code when you sign up, or $198 at Gearbest (that's around £137, or AU$274). Of course, prices can – and will – vary a lot so do shop around. Competition includes the Onda M2 (cheaper and using a Celeron J1900 CPU) and the Vorke V1 (with a smaller drive but again it's cheaper). Note that this is the third ultra-thin PC Voyo has unveiled – the previous one had a battery and the ubiquitous Z3735F processor. A few points to note before we continue. Buying from overseas – especially from China – is not for the faint hearted, especially if you're used to Amazon Prime or picking up your items from the high street. A lot of the tech brands on these websites do not have an actual online presence so if you need drivers or any sort of support, you're left on your own (although in Voyo's case the company does have a site, which you can find here). You might get stung by the taxman, whereas the delivery man will not only charge you an extra 20% VAT but also a fixed processing fee. That means roughly a 25% surcharge on a £140 product, which makes it a little less attractive. Then there's the aftersales: should your product fail, you will have to return it at your own cost, which can turn out to be as expensive as the item itself in some cases. Tracking a parcel weighing up to 1kg and costing up to £250 via Parcelforce costs nearly £60. For more advice, be sure to check out our guide to buying tech from online Chinese retailers. But all that said, this long preamble shouldn't distract from the Voyo V3 as a desktop replacement device. So let's move on to the PC itself – the first thing we noticed was the logo, which, from afar, looks like Dell's. It is a tad bigger than an old-school plastic CD case (remember those? ), with a sub-10mm thickness and a square-ish 130mm frame. Voyo used a white armoured glass pane on top of a metal chassis, which gives it a premium feel. The downside though is that heat dissipation is hampered. The competition either uses a full aluminium chassis that acts as a heatsink or has an active fan. The V3 has neither. It hardly weighs anything: 194g without the external power supply, a 12V@2A rated one. Curiously, Voyo opted for a USB Type-C connection for the PSU rather than the quasi-universal microUSB one; sadly, you won't be able to transmit data using it. 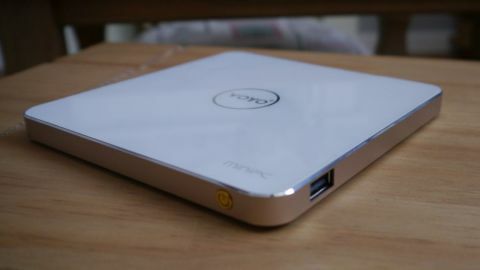 The power button and the connectors – a mini-HDMI port, two USB 3.0 ports, one USB 2.0, a microSD slot, and one audio jack – are located on three sides. Unfortunately, there's no Ethernet port but you can get wireless connectivity courtesy of an 802.11n Realtek network adaptor. The Atom x7-Z8700 is based on the Cherry Trail architecture, and is a 14nm CPU with four cores running four threads, clocked at 1.6GHz with a 2.4GHz Turbo, 2MB L2 cache and an SDP of only 2W. Since it supports dual-channel memory, Voyo fitted it with two soldered-on 2GB memory modules, totalling 4GB. The unit also supports 4K via HDMI but is limited to 30Hz. The on-board storage consists of a 128GB Foresee M2.2242 SATA SSD, a far cry from the eMMC ones used on cheaper models and a much, much better option. The Voyo V3 comes with Windows 10 Home. There's a default account, one with Voyo as the login and without UAC (User Access Control) or a password, and despite the lack of bloatware, these two aspects are enough to raise a red flag. Enthusiasts will find a way to set things right but that will require a lot of tweaking and tuning. Yes, you can use the Voyo V3 out of the box but be prepared for some legwork, something the average user should never have to do. Otherwise, the Voyo V3 is an excellent little box – it is reasonably fast under normal office workloads and its good looks will earn it more than a few "ooohs" and "aaahs". There's no VESA mounts, though, so you can't fix it to the back of monitors, and it requires a (bundled) adaptor for its 2-pin power supply. We can't help but hope that the next version of the Voyo Mini PC will solve some of the outstanding issues we had with the machine. Hardware-wise, 802.11ac is a must given the lack of an Ethernet port, plus VESA mounts should be added, thermal protection needs to be turned on in the BIOS to prevent any system lock-ups, and we can only dream of having HDMI 2.0 in the next iteration. The most important changes will have to come in terms of the software. A classic Windows 10 install (i.e. one that requires you to follow the usual registration steps) is essential for wider acceptance; any suspicion regarding the origin of the OS will condemn the device to a fraction of its addressable market. Voyo should also make drivers far easier to download, as these are vital for those who want to install their own operating systems (Windows 7 or Windows 10 Pro for example). Overall, the V3 is near to perfection – especially at this price – but it's still rather a case of so near, yet so far.